On Saturday, the fake news New York Times published all 20 pages of a confidential memo Trump’s lawyers sent Robert Mueller in January. On Saturday, The New York Times published a confidential memo written by Trump’s lawyers to Mueller dated January 29, 2018. Mr. Trump’s lawyers hand-delivered a 20-page confidential letter to Mr. Mueller in January. The letter was a response to his request that Mr. Trump agree to be questioned about allegations that he committed obstruction of justice. The lawyers argued that Mr. Mueller does not need to talk to the president and laid out a series of claims that foreshadow a potential fight over a subpoena, were the special counsel to try to force the president to testify. The Times obtained a copy of the letter as well as an earlier one sent to Mr. Mueller in June 2017, a month after he was appointed, which argues that “there is no statutory or constitutional basis for any obstruction charge” based on Mr. Trump’s firing of James B. Comey as F.B.I. director. The leaked letter could spell doom for former Deputy Attorney General Sally Yates. According to the contents of the letter Sally Yates lied to federal investigators about the Mike Flynn probe. Attorney Nick Short pointed out the former Deputy Attorney General’s deceit. 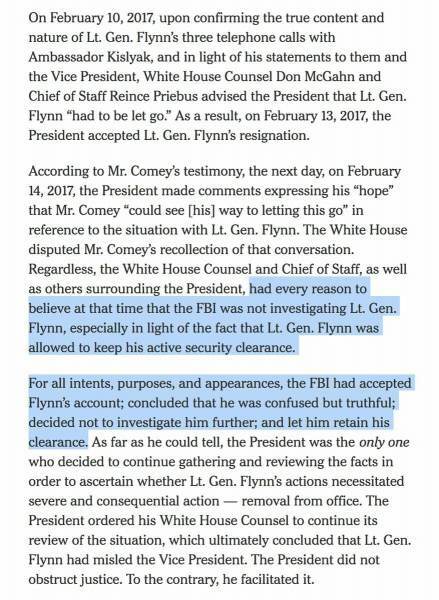 On January 24, 2017, Lt. Gen. Flynn was interviewed in the White House by FBI. The FBI operatives believed Flynn provided truthful answers. 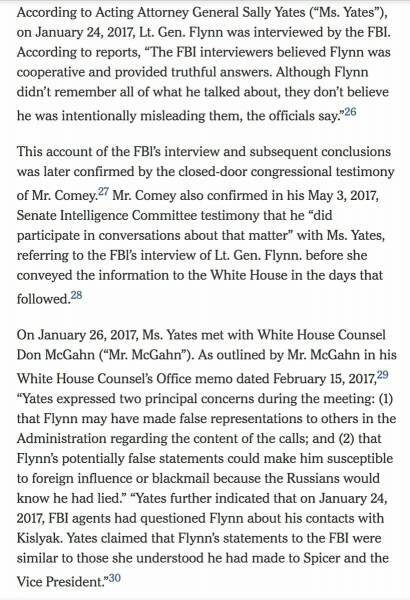 On January 26, 2017, Sally Yates met with White House Counsel Dan McGahn and told him Flynn lied. 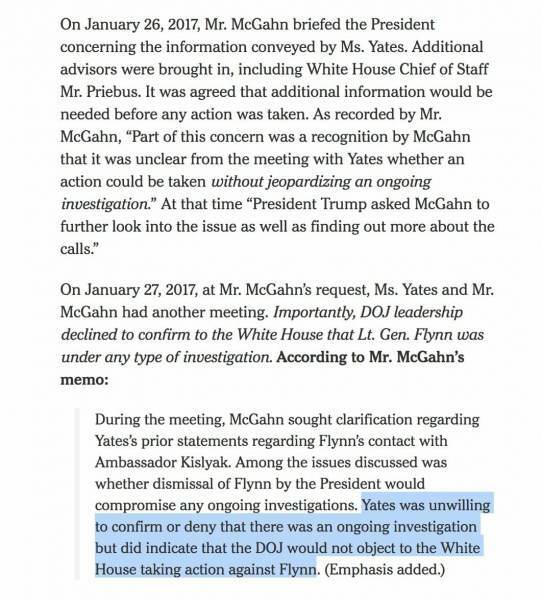 On January 27, 2017, Sally Yates and McGahn had another meeting and Yates lied about the ongoing witch hunt against the Trump team and she threw Michael Flynn, an innocent man, under the bus. Later the FBI told Michael Flynn he would not be charged and they were closing out his investigation. Then deep state hacks later charged him with lying to federal investigators. Sally Yates should find a good lawyer.